Our address is 7330 Chapel Hill Road, Suite 201, Raleigh, NC 27607. This is actually in Cary at Exit 290 on I-40. The newly approved ANSI A117.1-2017 Accessibility standard contains classroom acoustics - This new version of the standard was approved too late to be referenced in the IBC 2018 building code. It is expected to be referenced in the 2021 model building code. This puts the requirements of ANSI S12.60 into the model building code used in most states. States can potentially modify the model upon adoption, and speed of adoption by states varies. The 2018 IBC model building code has two significant changes in Section 12.06. Previously this section on sound isolation applied only to isolation between “dwelling units” which were typically individual apartments or condominums in multifamily buildings. This has now been expanded to “sleeping units.” This means that these requirements would apply between hotel rooms, dormitory rooms, hospital rooms and other similar situations. There is also new language saying “Alternatively, the sound transmission class of walls, partitions, and floor-ceiling assemblies shall be established by engineering analysis based on a comparison of walls, partitions, and floor-ceiling assemblies having sound transmission class ratings as determined by the test procedures set forth in ASTM E90.” There is similar language for impact ratings. On the positive side, this could be helpful in some cases where assemblies have not been tested. However, there is a downside. Even the most knowledgable people have trouble doing this in some cases, and there is nothing to keep someone who does not know what they are doing from rendering a completely erroneous opinion. In the coming months further changes will be proposed for the 2021 model code. Some of these are necessary improvements. However, multiple parties plan proposals and some could be problematic. Starting in 2013 an error has been in the HUD Online DNL Calculator required for use in HUD studies. As of December 2017, that error has been fixed. Expanded ASHRAE 189.1-2017 adopted with major acoustical requirements. This revision to 189.1 contains significant improvements and additions to the acoustical requirements for high performance buildings. Remember that the International Green Construction Code uses ASHRAE 189.1 now as its reference technical standard. It introduces acoustical requirements for sound levels, sound absorption and isolation into almost all kinds of buildings being built to a high-performance “Green” standard. This is much more than the basic isolation requirements for multi-family residential in the basic building code, and even those requirements are refined in this code. Anyone becoming involved in Green buildings should become familiar with these new requirements. Joe Bridger and several other members of ASHRAE TC 2.6 participated in its preparation over the last few years. It includes important speech privacy standards for healthcare. Both HIPAA (Health Insurance Portability and Accountability Act of 1996) and HITECH (Health Information Technology for Economic and Clinical Health Act, 2009) require caregiver-patient confidentiality. This is a standard that can be used to evaluate such privacy requirements. New Developments in Backup Alarms - A backup alarm is an essential safety system for vehicles used at workplaces. Unfortunately, the sound of the traditional backup alarm can be heard far away in quiet places. Since it is a sound designed to get attention, it can be very irritating to those hearing it in places where there is no danger. Systems have been available for years with selectable levels so the alarm could be set to the lowest level still loud enough to provide safety. Also, systems have been available that automatically sense the background level nearby and adjust the signal appropriately. Now some new concepts are available to reduce the degree to which these sounds are heard far from the vehicle. The first of the new alarms is a broad-band system developed in England. Rather than a beep-beep concentrated at a single frequency, this uses sound over a broad continuous band of frequencies. http://www.reverseinsafety.co.uk/bbs-tek/bbs-tek.html Near the source the higher pitched part of the sound stands out and most people would probably describe the sound from this as a hiss-hiss. The high-frequency parts of the sound die off quickly with distance, and the lower-frequency parts at reduced level blend in with other environmental sound. The developers claim it is also easier for people near a vehicle to localize where it is at. Our clients who have used them verify this. These alarms are now required in New York City. In the US, the two major suppliers Ecco and Preco have recently merged but each part of the business has a new offering. Ecco has teamed with a San Diego company that specializes in sound sources with strong directional control. Their effort has concentrated on aiming the signal to the back and minimizing the spread in other directions. To some extent this occurs with any signal mounted on the back of a vehicle, so the difference between the new signal and traditional signals is not as great as tests of the signal alone indicate. The Preco Safety division has developed an alarm that is a mix between the traditional pure-tone alarm and the broad-band alarm. It uses sound at a series of individual frequencies, not continuous but closely spaced. This creates a sound that has some of the characteristics of the traditional beep especially near the source, but also some of the characteristics of the broad-band signal especially far from the source. http://www.soundproofwindows.com/photos.html nothing really soundproof, but these are good. Alternatives to Fiberglass Duct Liner - We know that some facilities do not allow the use of fiberglass duct liner. The two objections appear to be concerns about moisture retention – mold growth and cancer. We believe these concerns have been addressed. A 1996 study by the University of Nevada Las Vegas confirms the results of numerous earlier studies which showed that fiber content in the indoor air from fiber glass lined systems is insignificant and does not adversely affect the health of building occupants. A 1997 study by Duke University showed that mold is no more likely to grow on fiber glass than on any other surface in the duct system. A second study by UNLV shows that mold grows at the same rate on lined sheet metal, duct board or bare metal. The International Agency for Research on Cancer IARC has established that fiberglass materials of the type used in duct liners are not classifiable as carcinogenic. Often facilities that do not allow fiberglass lining will allow the use of regular silencers that include fiberglass or mineral wool filler and flex duct that contains fiberglass. This combination can usually get the job done. Some manufacturers are offering silencers with cotton or polyester fiber packing. Silencers are also available with no fiberglass packing, often called “no fill” or “packless” silencers. These are typically less effective than regular silencers. McGill AirFlow makes both round and rectangular double wall duct with perforated inner wall and thicknesses of 1, 2, and 3 inches. They can provide a film between the perforated wall and fiberglass if desired. Alternative duct liners are available in two types of fire safe foam, polyimide and melamine, and in cotton. Sliding Doors for Offices - We are seeing increased use of sliding doors for offices and conference rooms without consideration of the privacy issues involved. These doors are usually installed barn style, that is sliding over the wall outside the office, leaving a gap between the door and wall when closed. In some cases these gaps are small and in some they are very large. Often there are no seals of any type. Large unsealed gaps are essentially like having the door open. Sealing systems for such doors are not as readily available as for hinged doors, and the available options will typically not work as well as with a hinged door. Virginia Building Code Requires Sound Insulation – The Virginia Uniform Statewide Building Code (USBC) has been modified to include requirements for isolation from outdoor sound in certain locations. Specifically this applies in areas greater than DNL 65 near Oceana Naval Air Station. The code provides two options. The first is that the walls, roof, and windows meet specified STC requirements that depend on the extrerior sound level in 5 dB ranges. One difficulty in this approach is that architects and builders typically depend on test data for the STC values, and test data are very limited for roof and exterior wall constructions. Fortunately the STC can be estimated and authorities accept such estimates. The other option provided is for a qualified person to analyze the construction plans and provide modifications as necessary to assure that the interior DNL due to exterior sound is reduced to 45. Basically, the outdoor to indoor noise reduction has to equal the difference between the stated DNL on contour maps and 45. This is not a simple matter of matching STC ratings. Proper analysis requires applying the transmission loss spectrum of the building components in third octaves to the A-weighted spectrum of the aircraft sound, considering the effects of the various wall window and roof areas and the sound absorption within the rooms, and subtracting 6 dB to account for going from a free-field outdoors to a diffuse field indoors. This is something that should only be done by an person very experienced in this kind of analysis. Unfortunately, rather than language to require the analysis be done by someone really qualified to do it, the code indicates that the “alternative design shall be certified by an RDP.” RDP means “registered design professional” which means an architect or engineer registered in the state of Virginia, very few of whom are qualified to do the analysis. Thus, it is uncertain exactly what will be required to meet this alternative more accruate approach. Yes we are now in our 40th Year. Dr. Noral D. Stewart became the fourth recipient of the Laymon N. Miller Medal for Excellence in Acoustical Consulting at Internoise 2018 in Chicago on August 29, 2018. This medal awarded in alternating years by the Institute of Noise Control Engineering and the National Council of Acoustical Consultants recognizes an “individual who has practiced acoustical consulting in an exemplary manner over a sustained period of time, to improve acoustical environments in and around buildings, transportation systems, work places, recreational and other occupied spaces, such that the quality of life for citizens and communities is significantly enhanced.” The award for Dr. Stewart was specifically for “sustained sharing of his acoustical expertise with colleagues and clients to create better acoustical environments and standards to evaluate them. The award is named for legendary acoustical consultant Laymon Miller, known for his teaching of noise control basics to many, clear communication, and sharing of his experience with colleagues. As indicated above, we are now in our Fortieth Year. That is a long history, and one of growth and major accomplishments. As announced last year, I am now working part-time as I am in my 70's. Joe Bridger is leading our daily operations and John Gagliardi and Sidd Mahjan are doing most of our field work. I am doing mostly smaller office-based jobs and assisting others on the staff with the benefit of my experience. We are fortunate to have a highly experienced staff, totaling over 100 years combined experience including my own. This does not count our highly experienced contractors whose total experience is greater than that. Very few firms can provide that level of experience. We will be looking for additional staff to meet your needs far into the future. Joe Bridger has been named General Manager of Stewart Acoustical Consultants in recognition of his expanded duties in the operation of the firm. Joe has also been elected as the Vice President for Finance of the National Council of Acoustical Consultants. In 2016 we briefly introduced you to Siddharth Mahajan as one of our interns. Sidd finished his MS in the summer of 2017 and we have hired him as a full time professional staff member. He first became involved in the study of acoustics and vibration as part of his senior project for his BS in Engineering. As a musician playing several instruments, he had long had an interest in sound (like Joe). This all led him to NC State and the program that has trained Noral, John Stewart, Joe, and Mathew. His thesis on Focusing of Ultrasound using Self Bending Beams may not seem directly applicable to our work. However, it demonstrates his ability to do good work and communicate it effectively. Sidd has strongly impressed us as he has jumped right into doing jobs efficiently. Our chief consultant in industrial and machinery noise and vibration control John Stewart has joined Noral Stewart in the Hall of Fame of the NCSU Department of Mechanical and Aerospace Engineering. John is the world recognized leader in control of noise in woodworking machinery as well as an expert on machine design. The goal of the Hall of Fame is to recognise the top 1 percent of graduates of the department based on career achievement. Around 20 to 40 graduates have been recognized each year since 2013. Others in acoustics in the 2017 class included Mehmet Caliskan of Middle East Technical University and MezzoStudyo, and Pat Niskode' retired from GE and now at Miami University of Ohio. Yes, another Stewart, though not related. Noral and John were undergraduate students at N. C. State at the same time. John stayed and completed his PhD while Noral worked for a period in industry. John basically wrote the book when it comes to noise control for wood working machinery. He had a full-time world-wide consulting career specializing primarily in wood-working noise before joining the research faculty of NC State to head a program to develop improved wood-working machinery. During that period he continued to consult part-time. We referred some wood-working industry projects to him. He also has experience in other industries, in vibration control, and in balancing. Since retiring from NC State, he has had a desire for some part-time consulting. Working with us is a natural fit. John will be working with Noral on all our industrial workplace noise control projects with assistance from Chris Eaton as appropriate. He will also be working on any vibration issues requiring measurement and analysis beyond the basic guidance for building systems. Some may remember John Gagilardi working with us on a part-time basis several years ago. John is now returning part-time at first but working toward a full-time position. John will be based at his home in Salisbury, NC but will be in contact with the office almost daily and will be visiting our office frequently. John did not do his degrees in acoustics but became involved in acoustics and has been a highly active continuing education learner. He seems to have been almost continuously enrolled in acoustics classes from one of the major universities. For the past several years he has been technical director for a materials manufacturer. However, before that he was involved in an acoustical consulting firm and an architectural acoustics test laboratory. John will be working heavily with Joe on architectural projects but will also be doing field investigations, especially in the western part of the state. Stewart Acoustical Consultants and AVCON are featured, with key personnel Frank Yarborough and Eb Strickland of AVCON, and Joe Bridger and Fred Schafer of our firm in this educational science production (6 minutes), which was born out of the work being performed on the cathedral. Stewart Acoustical Consultants teamed with AVCON to design a loudspeaker solution that would provide optimal speech quality. This was essential given the strong reverberation in this space, much more than we typically recommend but demanded by the diocese. Fred Schafer and Joe Bridger led this effort for our firm. Our interns including Sidd and Mathew George and his staff were integral in the construction of the EASE acoustics model, and subsequent AURA analysis. The EARS module was used to develop high quality auralizations that demonstrated to the Diocese of Raleigh the acoustical character of the space for music and unamplified speech, and the optimized speech quality provided by the loudspeaker system design. AVCON provided critical input on client requirements and is providing the full system drawings and installation. In addition, our firm was tasked to evaluate the acoustics as designed, and provide sound isolation and HVAC noise control solutions. The building was dedicated on July 26th, 2017. 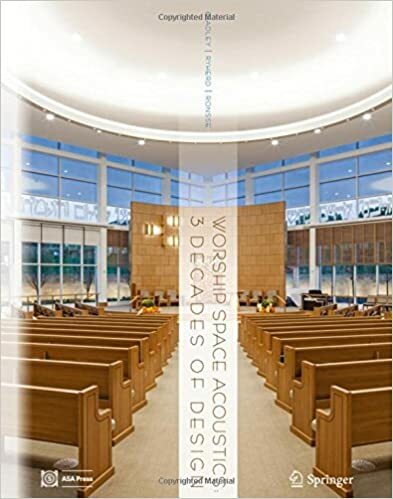 Several years ago we presented several posters on many of our worship space projects at a meeting in Providence, RI. The plan was for the Acoustical Society of America to compile a book of those posters. Well, it took a while but the book has been published containing case studies resulting from most of the posters we presented. The book is published by Springer Verlag and is available from many sources including Amazon. We have been using Soundplan and CadnaA for specific project needs for several years using short-term licences to calculate and plot sound propagation outdoors in detail. We have chosen to purchase a fully featured version of SoundPlan. With this program, we can import from Google Earth and other sources the geographic information system (GIS) data and image overlays as well as site plans to develop more precise and complex noise propagation maps for all kinds of sources, whether building equipment, transportation corridors, aircraft, outdoor venues (loudspeakers) or industrial sources. We can properly assess outdoor mass evacuation systems with this tool. It allows us to more efficiently problem solve, and develop cost effective solutions and display results in a way that is easier for everyone to grasp (using color plots and contour maps). The primary use will be to plot contours of sound radiated from sources in accordance with ISO 9613. The program also contains a module for highway sound propagation similar to the FHWA TNM program and another that allows highway model calculation using the actual TNM program. Other capabilities include calculation of sound indoors in industrial spaces and evaluation of the sound escaping to the outdoors. This program greatly enhances our ability to analyze and illustrate results for complex outdoor situations. The NC Chapter of the Acoustical Society of America celebrated its 50th Anniversary with a meeting at the Durham Bulls Athletic Park. A highlight of the meeting was a tour of the renovated Baldwin Auditorium at Duke University conducted by Mark Holden, Duke alumnus of Jaffe Holden Acoustics who converted the room from a mediocre auditorium to a world class multipurpose space. The photo below is of the chapter chairs (and one vice chair) who were present, most of whom have connections to us. Upon nomination by Noral Stewart, Dr. Adnan Akay (left)and Dr. J. Ronald Bailey (right) were inducted into the NCSU MAE Hall of Fame in 2016. Akay was Chair of ME at Carnegie Mellon and a Director of the US National Science Foundation and is now professor, chair of ME, and Provost at Bilkent University in Turkey. Bailey was a professor at NCSU, helped found this firm, led IBM Robotics Engineering for several years, and was Dean of Engineering at three schools before retirement. Leo Beranek passed away on October 11 at 102 after a long and productive life. He published his last paper in the Journal of the Acoustical Society in 2016, 77 years after his first in 1939, co-authored with Professor F. V. Hunt and fellow student Da You Maa. A few highlights from Beranek's biography. · Becomes interested in radio as teenager, works way through college in Iowa repairing radios, wiring houses, and play drums in a band. · Near senior college year, happens to help a motorist change a tire. Motorist is former Harvard professor; author of a radio paper Leo had read that morning. Gets help with scholarship to Harvard. · Works on development of 33.3 rpm Long Playing Record as a student project. Receives PhD 1940. · Went to work in the war effort, developed ways to quieten the interior of aircraft and make radio communication with pilots at high altitude possible. Helped develop sound effects for Phantom Army, in the process building the world’s first Anechoic Chamber. Commissioned as Captain of the fake USS Beavertail by Navy, develops way to get radar information more quickly to Navy gunners. · After war, becomes professor at MIT, publishes first book in 1949, asked to do the acoustics for the new United Nations building, and founds Bolt, Beranek, and Newman (BBN) consulting firm which would become largest acoustical consulting firm in history. · Develops world’s largest muffler for NASA supersonic engine test facility. · When NY Port Authority bans new jet commercial aircraft, Beranek leads a rush major research effort to define the differences in sound between jets and propeller planes and necessary silencing to allow the coming of the jet age. · BBN does many architectural acoustics projects such as renovation of the Tanglewood concert shed, and Beranek leads development of NC Curves method of rating sound in rooms. · Beginning in the 1950’s, BBN leads in the application of digital computers to acoustical research, buys first computer produced by Digital Equipment Company, invents the modem, and eventually builds the initial computer network that evolves into the internet. The email system as we know it is developed at BBN and the first email with the @ is sent from BBN office. · Beranek successfully leads effort to take over license of an existing operator for a TV station, going three times to the US Supreme Court, then manages the station for 10 years earning the reputation as America’s best TV station before selling it and making a major money contribution to the Boston Symphony Orchestra. · Retired from BBN and the TV station, Beranek leads the acoustical design of several highly successful concert halls in Japan. · Author of at least 10 books, in 2012 at age 98, publishes revision of book first written in 1954. · Starting with a citation from Harry Truman for his WWII contributions, Beranek has received almost every award possible in the acoustical world, plus one from the broadcast industry for station management and the National Medal of Science from President George W. Bush. AIA Credit Course in Architectural Acoustics Available - Both Noral Stewart and Joe Bridger have been certified by the Acoustical Society of America as presenters of a one-hour course in acoustics that qualifies for health, safety and welfare credit through the AIA. The basic one hour course must follow slides provided by ASA but can be supplemented with the experience of the presenters and special topics of interest to a particular audience. Stewart Acoustical Consultants is pleased to provide this class on a limited basis free of charge to small groups in our office, or to larger architectural firms at their offices in the Triangle Area. We are also open to presenting the class to multi-firm groups of students at locations outside the Triangle area such as at AIA Section meetings. Please contact Noral Stewart or Joe Bridger for information. Products Mentioned on our Website and in our Newsletter - You will notice that we have started mentioning some specific products on this news page an in our Newsletter. These are not intended as general endorsements and are not paid advertisements. These are usually unique products available from only one supplier that meet special needs. Our intent is to make people who have such needs aware of these products that are usually new and that can sometimes be difficult to find. Suppliers with new or unique products should feel free to contact us.